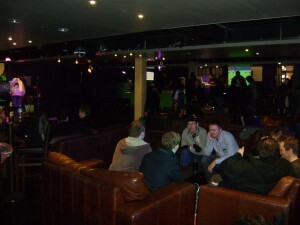 It was held at the London Metropole University Rocket bar, which seemed to be a rather small venue for what this will hopefully branch out and become. 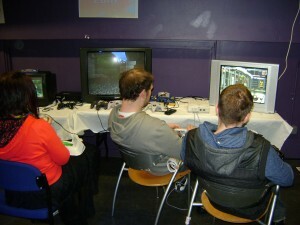 There were various areas where you could go and experience gaming – a modern area for PS3, 360 and Wii fanatics, a LAN area for all the PC gamers, if 10 man Bomberman on the Sega Saturn was your thing then you could join in with that too, and finally a rather well stocked Retro area with more CRT TV’s than I have seen in a long time. 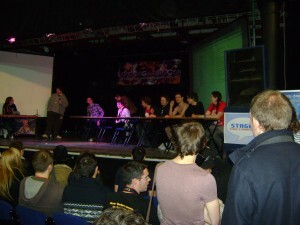 Upstairs, there was a big stage where invited guests such as Guru Larry, Ashens and BrentalFloss all appeared, doing some Q&A sessions for the gathered masses. 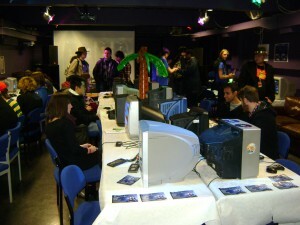 Elsewhere more modern gaming areas could be found and alongside that, an all out Super Smash Bros Brawl area with again up to 10 players at a time involved. 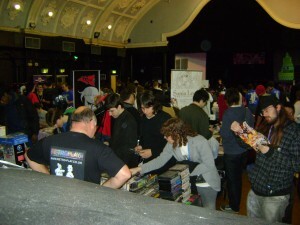 It was also good to see a smattering of traders at the event, though one had to be careful with the wallet as the retro stuff was priced highly but all in rather good nick. 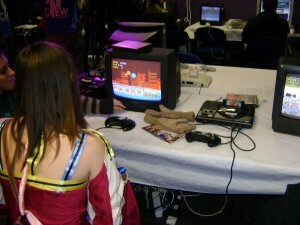 The event also ran alongside their usual Anime convention, with the games part being used for the first time. Whilst there is a certain amount of crossover between the two this was definitely more games orientated and the upcoming event in February 2012 plans to focus more heavily on Anime. All in all there was plenty to do and see and have a go on. 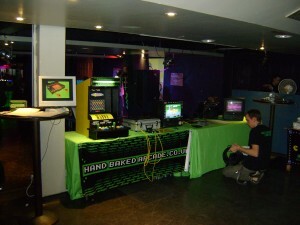 I managed to revisit my love affair with Point Blank on the PS1 and, whilst some of the retro stuff broke down, there was still plenty of choice to sit down and sample. The only criticism of the event which has been prominent is the organisation. A lot of events were cancelled or pulled at the last minute and upon arriving at the start time of 11am it was at least a further hour before the event managed to kick off. I spent a rather long hour waiting for everything to start while people ran round looking for cables. The bar was well stocked and very busy, and whilst the food on site looked and smelled great I think more thought needs to be given to the catering. There was very little to choose from and a long queue, so unfortunately like many others I preferred to wonder 250 yards down the road to McDonalds instead. So all in all, with any new event starting up there are going to be a few teething issues and so this was not a bad event to go and see. The next event is planned for (to confirm) and if you are in the area it is definitely worth a look. I would once again like to extend my thanks to the team for their kind offer of an invitation and look forward to seeing them again soon. Meanwhile have a look at the images below for some of the goodies that were on general public play ! 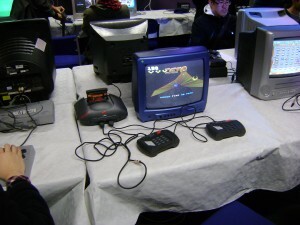 Print article This entry was posted by RetroBear on January 3, 2012 at 10:39 pm, and is filed under Everything Else, Retro Reviews, Uncategorized. Follow any responses to this post through RSS 2.0. Both comments and pings are currently closed.